The safer solar telescope. Solar viewing is a great activity for amateur astronomers and school kids. Now it's safe and practical. Observers or students in a small group can view and track sunspots across the Sun. A beautiful, fascinating, and durable astronomical tool that everyone will enjoy. Shipping is included in price. See shipping exceptions and Staff Pick Review below. Caution: Never look directly at the sun without proper protection. Adult supervision is always recommended. 16" H x 15" L x 6" W.
Shipping is included in price. Item is dropshipped from manufacturer. Sorry, no delivery to APO/FPO addresses or PO boxes. Please note: Overnight and 2-day shipping are not available for this product. 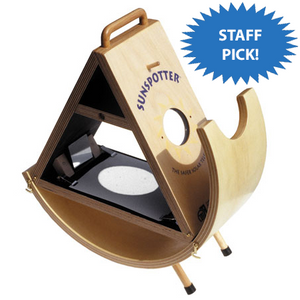 The Sunspotter is one of the handiest astronomy outreach tools I have ever used. It is sturdy, striking in appearance, and perfect for use with small groups of all ages. It’s simple to transport and set up -- it even includes a built-in handle, and its own instructions are printed on the side. "Is it safe?" That's the question always asked when you are observing the Sun, and the Sunspotter is hands down one of the safest solar "telescopes" out there. There is no filter to worry about scratching, no direct line between the Sun and your eyes. The Sunspotter projects a magnified image of the Sun onto a piece of paper, and the image is large and crisp enough that even fairly small sunspots are visible. Since it uses pieces of paper clipped onto its projection area, visitors can even take turns quickly drawing the disc of the Sun and its spots while in use. Of course, for solar eclipses the incoming shadow of the Moon is very apparent and easy to observe with a group! The Sunspotter’ s largest drawback is also a notable strength. It is a fully manual observing system so there is no automatic "tracking" of the Sun. Its field of view is wide enough that you don't need to move it constantly. However, visitors notice the Sun's projection drifting across the view and will remark on how fast it moves, allowing a great discussion about the rotation of the Earth and the swiftness of both our movement and the apparent movement of the objects in the heavens. This great conversation happens almost every time I have the Sunspotter out!